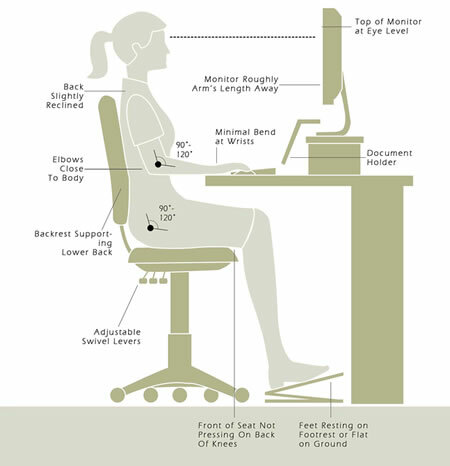 Ergonomics is improving the “fit” between the worker, the work environment and the work being performed. Identifying injury risks in the workplace related to design, operations, worker anthropometry, work habits, environment, work flow or other related factors is the first step to reducing the costly musculoskeletal disorders (MSDs) prevalent in today’s workplaces. MSDs are general aches, pains and injuries in the soft tissues and joints. They occur most frequently in the neck, lower back and upper limbs. These musculoskeletal disorders account for a significant proportion of worker absenteeism. Carrying out ergonomic workplace and workstation assessments will help to identify work activities which increase the risk of workers developing musculoskeletal disorders. Early identification of such activities can allow early intervention to reduce the risk of injury. Such intervention may include changes to the workstation, to work equipment, to work postures or to the system of work. Our team of physiotherapists can provide recommendations to both employers and employees to reduce strain, improve work posture, modify tools and equipment, create rotation schedules, and improve productivity and worker comfort. On-Site Functional Job Analysis and development of functional job descriptions, job profiles, written support for essential job functions, post offer screening criteria. Ergonomic Evaluation and Consultation with recommendations for modifications, assistance with ergonomic controls, input for new product designs or processes. Office Workstation Evaluation and assistance with obtaining appropriate equipment. Post-Injury Management and Return to Work Program with recommendations for job modifications, earlier return to work, prevention of future injury, work conditioning. For further information and/or to make an appointment, please contact us.